Directions: Dissolve contents with 160ml boiling water. Ingredients: Powdered Miso (Soybeans, Rice, Salt) (49.9%), Dextrin, Sugar, Flavour Enhancer (E621, E631, E635), Dehydrated Spinach (Spinach, Starch Syrup) (3.0%), Chilli Pepper (3.0%), Tofu (Soybeans, Firming Agent [E516], Trehalose, Modified Corn Starch) (3.0%), Salt, Dehydrated Green Onion (1.0%), Powdered Kelp, Acid (Citric Acid). 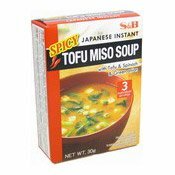 Simply enter your details below and we will send you an e-mail when “Spicy Tofu Miso Soup (Instant) (日本辣豆腐麵豉湯)” is back in stock!